At an ill-advised pitch meeting, perhaps five years ago, a Disney executive pointed out that while they certainly knew how to make money off of Johnny Depp, they no longer knew how to do it with pirate movies. Perhaps they could transition the popular actor into another franchise. But which? And how? Step one: Find a brand that no one cares has cared about for some time. There hasn't been a big screen adaptation of the Lone Ranger in over 30 years, so the antiquated cowboys and Indians property based on the radio serial served nicely. Step two: Replace Orlando Bloom with Armie Hammer. Admittedly, this is always a fine idea. Step three: Bring in Helena Bonham Carter for palatable laughs. Step four: Maintain the vast majority of the Pirates of the Caribbean team and throw money at it until it’s a movie. Marketing a populist specimen from a forgotten genre would've been a tall order no matter what the circumstances. (This is doubly so when trying to appeal to a generation with absolutely no tie to the source material.) 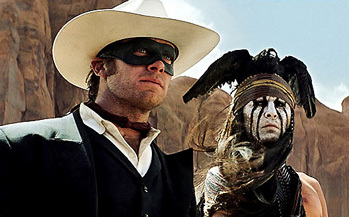 But Disney gave themselves an insurmountable challenge when someone — perhaps Depp himself, who seems to view his role as Tonto as a grand apology for the white man's abuses against Native Americans — injected an overpowering self-seriousness into The Lone Ranger.